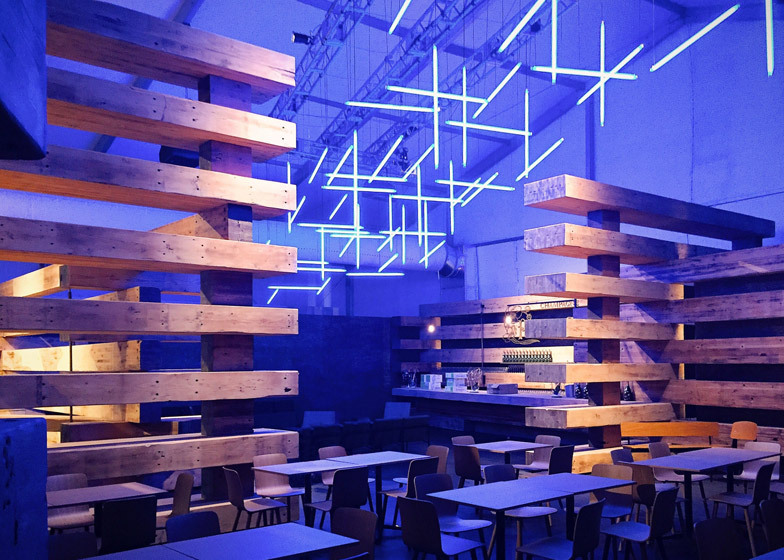 Olson Kundig's Design Miami lounge "not going to blow away"
Design Miami 2014: Seattle studio Olson Kundig Architects used stacks of timber beams to form the collector's lounge at this year's Design Miami fair (+ interview + slideshow). 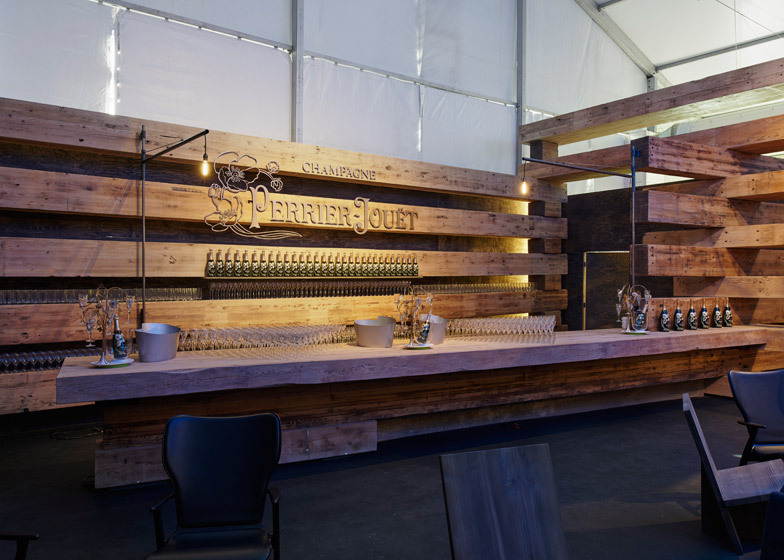 Olson Kundig Architects wanted to bring the forests of Seattle to Miami's tropical setting, so stacked 30-metre-long lengths of timber to form a space for a bar, seating and meetings for VIP visitors to Design Miami last week. "We did research and were looking into historic photographs of lumber yards in Seattle," project architect Alan Maskin told Dezeen. "We were really intrigued the way that, a hundred years ago, they would literally stack wood several stories high." 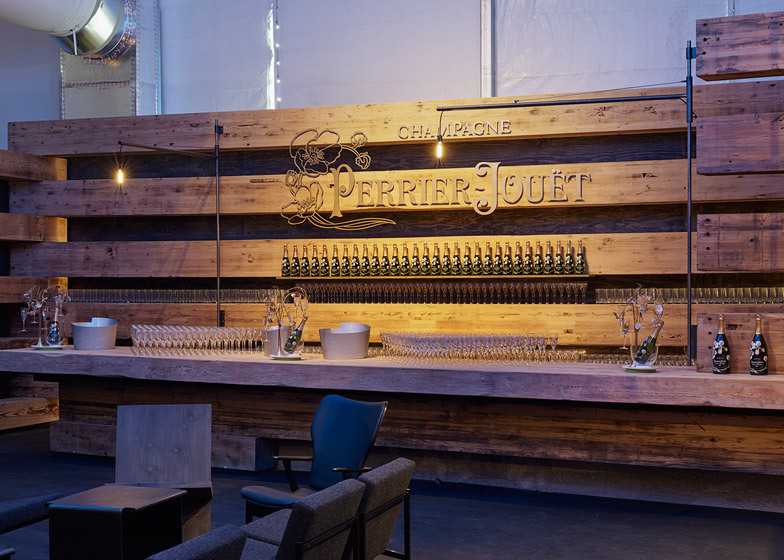 38 Douglas fir beams were used to construct the walls of the lounge, sourced from a doomed office building in Los Angeles. Olson Kundig Architects worked with Ted Hall at Canadian company Spearhead Timberworks over an eight-week period to design the structure, as well as find, transport and work the surfaces of the wood to the desired finish. "We kind of excavated through the original surface to get to the patina," said Hall. "That really was the character that we tried to maintain." The amount, weight and lengths of the beams used were all constrained by what could fit onto the back of the lorry used to transport them to British Columbia and then to Miami Beach. 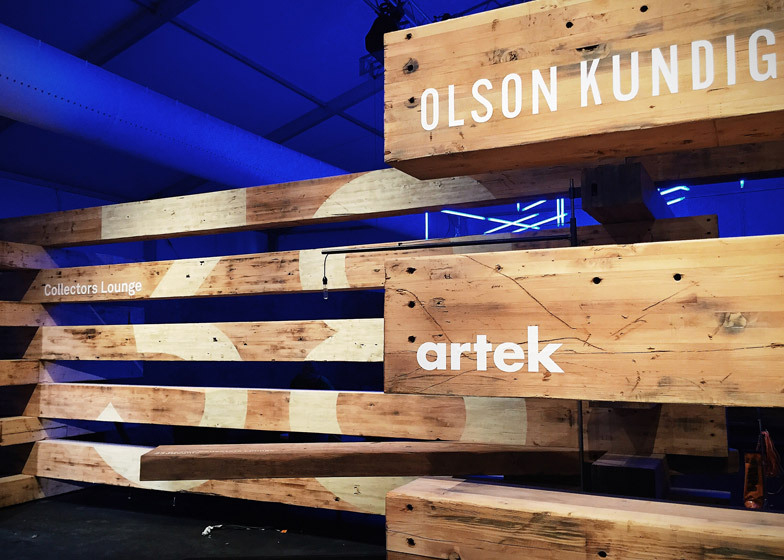 Once they arrived at the Design Miami tent, the heavy pieces of wood were stacked up using a forklift so the ends balanced on top of each other. This created horizontal gaps within each of the walls, with extra blocks of wood added in the holes to maintain the separations. "This one is not going to blow away in the wind," said Maskin. "But we also wanted this place to be transparent, and I believe it's the first time the collectors lounge actually has this level of transparency where things can flow out and people can flow in." Most of the structure – weighing approximately 32 tonnes – was supported purely by the timber beams, while steel sections helped to reinforce longer cantilevers. 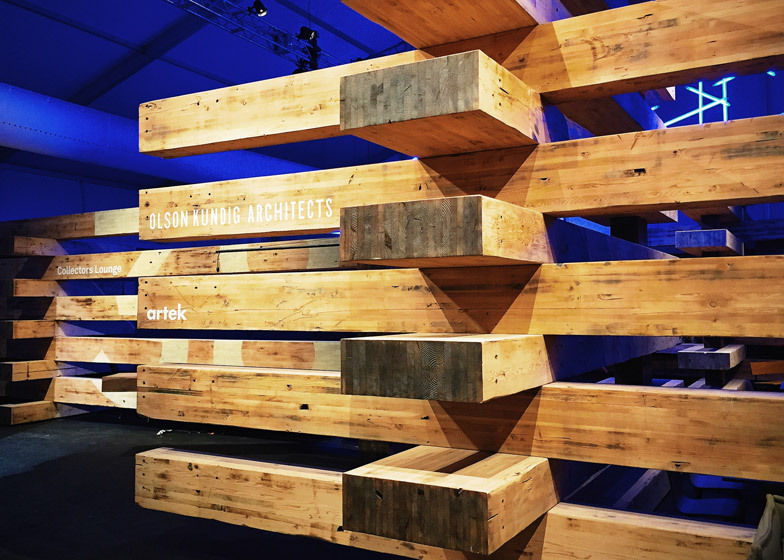 After the exhibition finished on Sunday, the beams were dismantled to be sent to the University of Kansas, where a group of architecture students will reuse them for their own projects. "Just like we had the chance to do what we wanted with them, the next designers will as well," said Maskin. Marcus Fairs: Tell us about this project. What is the idea? How did you do it? Alan Maskin: We're from the Pacific Northwest, and Seattle and Miami could not be further apart in terms of the United States – they're three thousand miles apart. We wanted to make this bridge where the Pacific Northwest had a presence in Miami. We did research and were looking into historic photographs of lumber yards in Seattle. And we were really intrigued the way that, a hundred years ago, they would literally stack wood several stories high. So we created a stacking concept where we wanted to come down and stack pieces of wood here. Then we had to find the wood that we were going to use. So we worked with Spearhead Timberworks and Ted Hall. We collaborated with him a lot. Basically we said: "We need to find some material to build this pavilion." Three months ago, this commercial office building in Los Angeles was being demolished, so we were able to get these beams from that building. 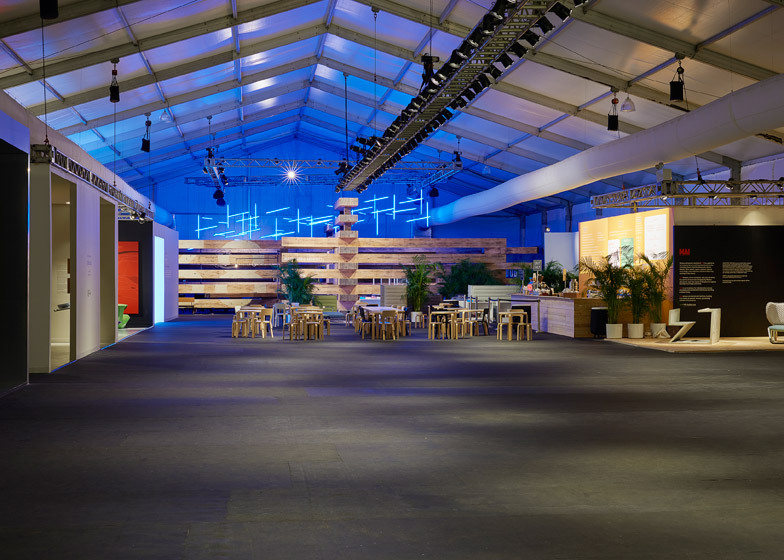 Design Miami is about collectors and collecting. This became a collection of mid-century timber beams. So that became our resource. The reason the project is called 38 Beams is because we could only fit thirty-eight thirty-foot-long beams on a truck. So they were literally brought out here. We stacked the beams in place, we bought a number of different artists from the Pacific Northwest to help us in the design of the project, and then, when we're finished, all of these beams are actually going to the University of Kansas. Architecture students there have a studio there called Studio 804 – a design and build studio. The beams will have yet another life, so they're going to use them there too. Marcus Fairs: Will they chop them up? Alan Maskin: You know what? It's up to the designers. Just like we had the chance to do what we wanted with them, the next designers will as well. 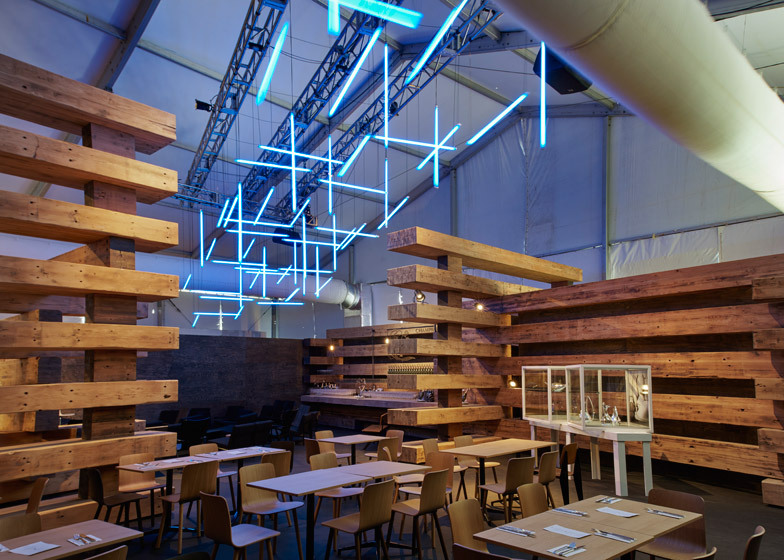 But all of the beams are made out of Douglas fir forest and they were milled in a lumber yard in Oregon. So it was interesting that they've had an interesting life, these trees. Marcus Fairs: These kinds of lounges are usually quite insubstantial, but this one is not going to blow away in the wind, is it? Alan Maskin: This one is not going to blow away in the wind. These beams are really heavy, thirty-foot long. Also, we wanted to do something here that was different, because I think that what happened to the Northwest design-wise is different to what happens in Miami design-wise. So I think there's a really interesting tension that exists between these two dualities. And that, for us, is really interesting. But we also wanted this place to be transparent, and I believe it's the first time the collectors lounge actually has this level of transparency where things can flow out and people can flow in. Marcus Fairs: How did you stack them? Not by hand, presumably? Alan Maskin: No. They were all stacked and placed by one forklift. Marcus Fairs: Are they just resting on each other, or is there any kind of steelwork? Alan Maskin: In some key areas, like in the corner back there, if you look very carefully, you can see one steel beam on that cantilever piece. It's doing a lot of structural work to hold them together. But for the most part it's the beams and their own weight that's actually making the structure. One of the things that's really important about Spearhead is that we work really closely with the fabricators. Marcus Fairs: How much do all of the beams weigh together? Ted Hall: That's a very good question. They weigh exactly the maximum amount you can fit on a fully loaded semi truck, so it's probably around 70,000 pounds (32 tonnes). Marcus Fairs: Tell me about the fabrication. Ted Hall: Really the material was the inspiration for the design very much, so we tried not to do too much to them. We kind of excavated through the original surface to get to the patina. And that really was the character that we tried to maintain. As far as the fabrication goes, it was a very spontaneous project in the way that we worked with Olson Kundig. Just going back and forth between material images and computer model sketches, and it was incredibly quick compared to most of the heady jobs that we've done together. Alan Maskin: This was an eight-week project. So it was really condensed in that regard. 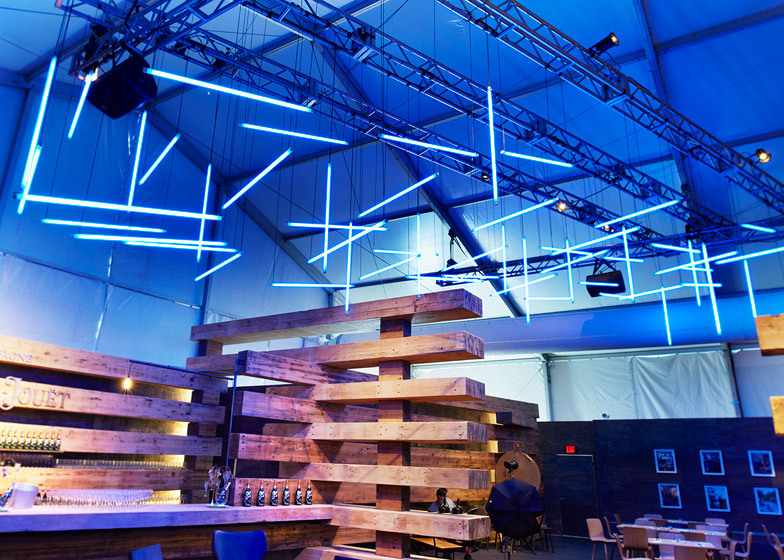 The beams were brought from LA all the way up to their shop in British Columbia. And we also experimented there with prototypes of how to stack them and how much we could cantilever, where we might need some structure and so on. Marcus Fairs: They've been on a real road trip then. Alan Maskin: They have been. And it will continue because they're going to the University of Kansas where the students will work on them next.